As a baseball photographer, the season is long and each day usually provides some sort of story, some worth remembering and others, well... there's always tomorrow. And then, there are the once in a lifetime days, the career days, the days you will never forget. July 23, 2009 was one of those days for me. Now that the dust has settled and I've had some time to reflect on what happened, I'd like to share with my fellow Sports Shooter friends the thoughts, emotions and outcome of what it's like to experience and capture for the ages one of baseball's rarest feats. The perfect game. I'd been looking forward to covering the finale of the four game series between the Rays and White Sox. We (being the team photographer, I always consider the White Sox "we") had an opportunity to get back into first place with a victory, and with Mark Buehrle on the bump, not only did the chance sound reasonable, it might also happen quickly. Mark is well known for his "speed", and game times at or around two hours are a regular occurrence for the All-Star lefty. Before the game I reviewed my archive and noted that I've already shot a number of games with Mark pitching, so adding more "file images" wasn't really a pressing thing on my agenda. We were preparing a cover story on Scott Podsednik, so Scott was really my focus (pun intended) for the day. Things began well for the White, helped by a second inning grand slam by Josh Fields that gave the White Sox a quick 4-0 lead. But in general, it was a rather "boring" game- no pictures, a lot of three up and three down innings, and as we progressed along, the clouds came and we had a few sprinkles to dampen the day. The fifth inning started and that's when the chatter about a no-hitter began in the photo box. We had more than the usual amount of photographers in house this game, and I remember telling Brian Kersey "I don't know if I'm in the mood to shoot a no-hitter today, I'm a little tired from this homestand." Superstitions be damned, we were gonna start talking about what was going on, since A) we really didn't think it would happen anyway, B) Mark had already thrown a no-hitter, how likely would it be that he would throw another and C) the Rays are a pretty dominate offensive club. They are tough to keep off base and then once they're ON base, tough to keep in one place. I decided to change the conversation to that of a perfect game. I let everyone know that we had more than a no-hitter going, we had a perfecto, and, well, I'm tired and I just don't think I can handle the pressure of shooting a no-hitter, much less a perfect game. However, I think most of us in that box agreed that if we get into the seventh inning and Mark's still throwing a perfect game, it will be time to get serious. Minutes later, the side was retired and we were moving on into the top of the seventh. Show time, my friends! Time to "put on the blinders, block out the noise and put 'The Plan' into gear." The Plan. I've rehearsed The Plan in my mind, and occasionally, on location a few times in recent years. But as luck would have it (or really lack of luck), someone would get a hit and it was, well, better luck another day. Mark hugs DeWayne Wise, who made a spectacular catch with nobody out in the top of the ninth inning to rob Gabe Kapler of a home run and keep Mark's "perfecto" intact. July 23, 2009 was just that as I went back to my office to re-group and prepare. I loaded new batteries, installed fresh cards and made the decision as to which lenses to come out with for the top of the eighth inning. I grabbed my Nikon 70-200 and 200-400 zoom lens and set my D3 on the 70-200 to shoot RAW plus JPG and headed back to the field. For those of you who don't know me personally, not only is the combination of baseball and photography my career, they are my two passions. I LOVE the classic photos from the game, photos that have forever been associated with the great players and moments in Major League Baseball history. When I would think about no-hitters and perfect games, iconic images of Sandy Koufax and Don Larsen come to mind. To me, what made these images classic and memorable was one key ingredient- the scoreboard in the background. Scoreboards tell a wonderful story all by themselves, whether they were from the Yankee Stadium in 1956 with Don Larsen (http://sportsillustrated.cnn.com/vault/gallery/featured/GAL1145633/2/8/index.htm), the 60's at Chavez Ravine with Sandy Koufax or July 23, 2009 with Mark Buehrle. The combination of the player and the scoreboard tells the perfect visual story. There you have it. The Plan... for "The Picture." Now comes the tough part. Execution! I made my way down next to the Rays dugout on the first base side of U.S. Cellular Field in the top of the eighth inning and sized up the situation. The VERY BEST location was a seat in the middle of the front row, one section to the left of the dugout. Cool! Well, not quite. There were fans in those seats today, and considering what was going on, my talking them out of those seat were, well.... impossible. That's when I noticed that maybe that seat wasn't so great... it was in-line with the Rays on-deck circle. And there isn't a player in the game today that just "sits in the on-deck circle." They move around. Dangerous stuff when you're attempting to record history. Time to modify The Plan. I went right next to the Rays dugout and talked to one of our security officers who was stationed in that spot. Thankfully, most everyone at the ballpark knows me, and he graciously let me sit in front of him on a stool near the Rays batboy. I sized up my shot and felt it would work. It was the best I felt I could do with the least amount of "risk", so I settled in. As Mark polished off the Rays in the eighth, I felt it was a good time to have a "chat" with the Rays batboy. I tapped him on the shoulder and said "should 'things' happen next inning, please be aware that I'm right behind you to your right, and to please avoid as best you can walking in front of me to the dugout." He shook his head in acknowledgement and, as I can say now, remembered what I said. I don't know your name young man, but if you read this before I see you again, "thank you." Job well done! Mark high fives manager Ozzie Guillen moments after taking some shaving cream to his face.. I "put on the blinders" to start the ninth. I basically spent the entire time looking through the lens and listening to the crowd reaction. The roar or groan of the crowd would be my audio indicator as to what was going on around me. All I had to do is concentrate. Then I heard the crowd. A loud roar bellowed throughout U.S. Cellular Field as DeWayne Wise made one of the greatest catches, considering the importance of the catch, I think there has ever been! I really didn't know how great a catch it was until I watched highlights later. WOW! One out! Quickly, the next batter, Michel Hernandez, was out on strikes. One out to go. While all this was happening, I was "test shooting" The Picture with every batter. I really had to concentrate on my focus point. Using the 70-200, I have found it is much harder for me to focus "short glass" than it is long telephoto lenses. My tests confirmed this. Settle on a focal length that works, concentrate (quickly, remember, it's Mark pitching!) on focus and be ready. The 200-400 was between my legs, ready to go once the pitch was delivered. But The Picture was to be made with the 70-200. I heard the bat followed by the crowd roaring. Dropping my 70-200 to my lap I grabbed my 200-400. History! I was now in what I call "machine mode". I felt like no one else was around me. Just shoot as best you can. A few of the Rays made their way back into the dugout, so I was unable to see the initial reaction and celebration, but I picked up on it as soon as my sight lines cleared. Mark waves to the 28, 038 lucky fans who witnessed history on a wonderful July afternoon at the ballpark! If I accomplished what I had rehearsed in my mind for years, preparing for this moment, I should have succeeded in achieving my goal- The Picture. Everything else would be gravy from this point on as long as I made The Picture. I didn't have time to "chimp" The Picture until later. Geez, that makes me reminisce about what it would have been like to have made The Picture back in the film days. No chimping, 36 frames per roll, lousy processing screwing it all up, scratches on the emulsion side of the film from a crappy slide mounter. Forget hitting the buffer! Try capturing these great moments with 36 frames per roll! (Flash back- Joe Carter walk-off World Series winning home run. Film. How did we do it?) Film. The "good old days"? I don't think so! It's a no-brainer for me. I'll take my chances with filling the buffer! After a few seconds, I leapt over the wall (remember, the security guards all know me and I had club credentials. Don't try this or you might end up spending the night in "the cell", and I don't mean U.S. Cellular Field, and headed out to follow Mark. I set my 200-400 down on the ground behind home plate and quickly realized that the 70-200 was a bit tight for what I really needed. But it was still time to concentrate, and I'm glad I was because I was able to capture Mark hugging DeWayne Wise, who made the perfect game saving, home run stealing catch. As Mark began conducting on field media interviews, I thought this break might allow me to change to some shorter glass, but I didn't want to leave the field. Luckily, I spotted Deb Theobald from our front office behind home plate and I asked her if she could run into my office and grab "the short lenses" sitting near my desk. Within a minute, she produced my 24-70 and 14-24 and I made a quick swap, exchanging the 70-200 for the 14-24. Good move, because it enabled me to get in close to Mark and make the picture of him waving to the fans and celebrating with Ozzie Guillen, which I would have never been able to do with the longer glass. Thanks, Deb! It looked like all of the wire and newspaper photographers went to transmit as soon as Mark left the field, but I made my way to cover his press conference and was surprised to see that I was the only still photographer there. Reminiscent of my coverage of the White Sox World Series run in 2005, I was in "historian" mode and wasn't about to leave Mark's side until he returned to the clubhouse. Shortly after the press conference began, word came that a certain White Sox fan that lives in the White House was looking to talk to Mark personally. 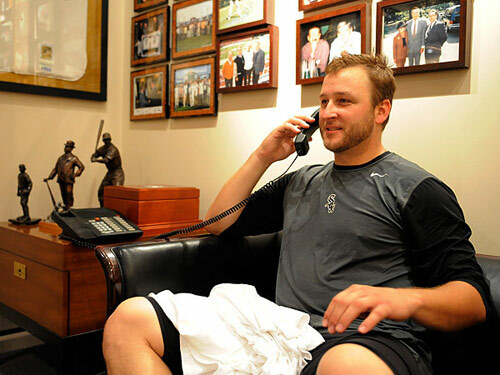 Quickly, the press conference was concluded and Mark was led to White Sox chairman Jerry Reinsdorf's office, where he would take the call from President Barack Obama. Marty Maloney from our PR staff and I were allowed to record this memorable moment. Marty's video made the evening news around the country, and my images were distributed via Getty Images to the world as well. And of course, the fun was just only beginning! My cell phone began ringing (unfortunately- I should have put it on "silent') before the dust even settled. I was covering the press conference when I heard from baseball picture editor Nate Gordon at Sports Illustrated. Nate left a message asking if I made The Picture, and to give him a call. Nate, Brad Mangin and I have discussed The Picture many times, usually in the context that no one made it, so I quickly made a return call to let Nate know that it was in the bag. That said, I wanted to make sure that The Picture would be initially available exclusively to Sports Illustrated. Of course, the White Sox could use it immediately since I was working for them, but that meant that MLB Photos and Getty Images would have to wait to be able to post or distribute my two images of The Picture. They could distribute everything else, just not The Picture. The number one White Sox fan in the World, President Barack Obama, placed a call to Mark after the game to congratulate him personally. It took countless phone calls and emails to ensure that this indeed was worked out, but in the end it did and I believe by keeping this photo OUT of the mainstream media, it made it a special image, and I was rewarded for these efforts when I got the call from Nate while I was out golfing on Monday to tell me that The Picture was August 3, 2009 cover of Sports Illustrated! Very cool on many counts, since not only was The Picture used on the cover of SI, but The Picture itself was also such an important moment in baseball and White Sox history. Only the 11th White Sox cover in Sports Illustrated history. The baseball fan in me was amped up about this! Next time you have the opportunity to cover something historic, think beyond a potential jube picture or isolated reaction image and think history, think about all those cool, old images that were shot loose and include items that tell the story. Don't over think your plan, yet think ahead of time (now is a good time) and have a plan in the back of your head so that it's ready to go when you need it. You'll be glad you did, because history happens quickly and usually, without warning! I'm truly blessed and still living the dream. I've been able to cover such historic events such as Kirby's 1991 World Series home run, Joe Carter's 1993 World Series walk-off Series ending home run, the 2005 White Sox World Championship run, Jim Thome's walk-off 500th home run, and now Mark Buehrle's perfect game. I can only wonder to myself. What can be next? Whatever it is, whenever it is, I plan to be ready! Oh yeah, remember that cover story on Scott Podsednik I was working on? A certain White Sox lefty changed our plans!